Paul Robeson Community Wellness Center Celebrates Grand Opening in South L.A.
Neelam Sharma, Community Service Unlimited’s Executive Director, at the Paul Robeson Wellness Center grand opening on August 18, 2018. Congratulations to our clients at Community Services Unlimited Inc. (CSU) on the grand opening of the Paul Robeson Community Wellness Center in South Los Angeles. This vibrant community anchor includes a permanent produce market and cafe, commercial kitchen, and space for nonprofit programs. Founded more than forty years ago by the Southern California chapter of the Black Panther Party, the organization has deep roots in South Los Angeles. Since its inception, CSU has developed programming that addresses issues facing the local community, including pre-k education, after school programs, medical screenings, food pantries, and more. In the early 2000s, CSU staff noticed that young people in their afterschool programs did not understand the connection between food and their health, and had minimal understanding of their own cultural food histories. The organization recognized that limited access to healthy food is one of the many symptoms of disinvestment in low-income communities and in 2003 undertook a comprehensive community-driven assessment of food, health, and wellness issues facing their community. Based on identified needs, CSU responded in 2004 with an updated suite of programs to create a sustainable food system in South Central Los Angeles. In 2007 the organization launched Village Market Place (VMP), its food-access social enterprise. VMP provides fresh, locally-sourced produce to South Los Angeles residents through wholesale produce distribution, pop-up produce stands, catering services, and more. While a variety of food markets are scattered throughout the area, very few offer fresh produce and healthy options making the marketplace a vital and culturally responsive resource for local residents. With demand for CSU’s services and programs exceeding their capacity, the organization developed a plan and purchased the historic Paul Robeson Center, with the goal of taking the organization to its next stage of growth. In early 2018, Self-Help Federal Credit Union, a member of the California FreshWorks lending network, provided CSU with a total of $2.5 million in construction and permanent loans. California FreshWorks provided credit enhancement and technical assistance to solidify the organization’s business plan for their new space. As part of the $3.3 million project, CSU transformed the 7,500-square-foot lot and 5,000-square-foot building into a wellness center with an urban farm, commercial kitchen, café, and has expanded the VMP into an organic produce and grocery market. FreshWorks is proud to support this vibrant community anchor, which will not only increase healthy food access, but will build greater racial and economic equity for local community members. 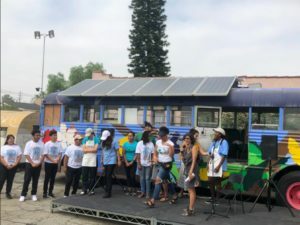 Check out this previous blog post by Catherine Howard, Director of California FreshWorks, which further details the way FreshWorks has leveraged financial tools, including credit enhancements, to build greater food equity in South Los Angeles.